The Waverley brownall range of air actuated ball valves are entirely manufactured in the UK and offer a unique compact design. 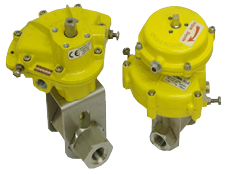 The actuators are the ideal complement to Waverley’s range of 1000lb, 3000lb and 6000lb class valves on previous pages. Waverley brownall’s actuated ball valves are sold as complete factory mounted units and offer space saving, corrosion resistance and long maintenance free operation. Simple robust design, allowing ease of use and installation. Compact and space saving · best torque/size package available. Only one moving part on the actuator allows the simplest and most reliable mechanism for quarter turn actuation. Durable corrosion resistant materials. The actuator casing is made from die cast zinc alloy and then epoxy coated. Waverley brownall’s quality control programme approved to BS EN ISO 9001- 2000, and ensures that each unit is manufactured to the highest quality standards and tested before leaving the factory.